Custom Eyes is a full scope vision practice that offers a wide assortment of contact lens options. Our doctors have the ability to fit some of the most difficult eyes in contact lenses. We are your Kansas City contact lens source! If you think that you might never be able to wear contact lenses, don’t believe it until you pay a visit to CustomEyes. Our optometrists in Lenexa specialise in contact lens fittings, products and services. Dr. Drake regularly recieves referrals for specialty contact lens fittings from other optometrists and opthalmologists from all over the surrounding area. Whether you need mutli focal lenses, specialty fits for astigmatism, keratoconus or just a basic fitting – come to your Kansas City contact lens specialists – Custom Eyes! We’ve managed to fit patients who were told they simply couldn’t wear contact lenses. With the right fit, contact lens can be comfortable and convenient. Better yet, contact lenses can improve vision, are excellent for most sports, and in some cases can replace glasses. We specialize in lenses for people with astigmatism, presbyopia, keratoconus and more. We also carry disposables, extended wear, continuous wear and overnight options depending on what best fits each patient’s lifestyle. 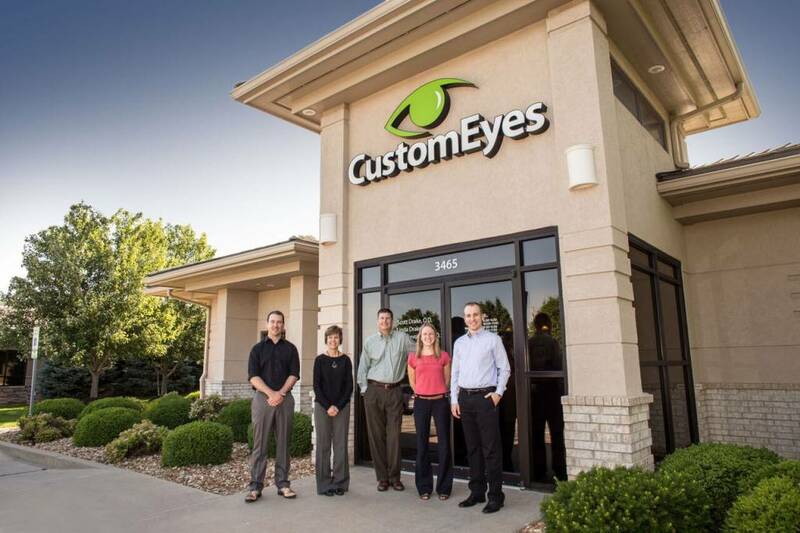 With offices in Lee’s Summit and Lenexa, CustomEyes serves all of metro Kansas City. Schedule a contact lens exam and fitting appointment today. CustomEyes offers a wide selection of contact lenses including disposable soft contact, bifocal/multifocal, toric, and colored lenses at our offices serving Kansa City, Missouri. Whether you wear daily, weekly or monthly disposables, or conventional (vial) lenses, check out our selection of lenses that fit your needs. Visit our offices in Lee’s Summit, MO and Lenexa, KS to get the best contacts in Kansas City. Specialty contact lenses are the best choice for many people who have various eye conditions. Do you have a very high prescription, dry eyes, astigmatism, complications from surgery, or presbyopia? Make an appointment today to get great fitting, comfortable contact lenses. Our practice offers specialty contact lenses including Synergeyes Duette, Bifocal, Progressive and Scleral Contact lenses. Dr. Scott Drake believes that a routine exam won’t provide some of the measurements and testing that are required to determine if your eyes are suitable for contact lens wear, and to generate your contact lens Rx. The wrong contacts can cause extreme discomfort, eye infection, blurry vision and damage to your eyes, such as a corneal abrasion (scratch), and can even lead to permanent vision loss. Convenient and comfortable, disposable contact lenses come in a large variety suitable for virtually every eye. We invite you to browse these pages to better understand how your contact lenses work, the types of lenses out there and how contacts can help with various vision conditions. A non-surgical way to say goodbye glasses? Ortho-k (or corneal reshaping) using contacts worn at night is an exciting option. RGP lenses are excellent for astigmatism. Because RGP lenses are custom made, they can be designed to fit your eye exactly. Our Eye Care Practice in Lenexa is specially equipped to provide keratoconus services and individuals which had corneal replacement surgery with state-of-the-art technology including corneal topography and external digital ocular photography. Our doctors have the experience to provide contact lenses on patients with keratoconus and corneal grafts. Many of our patients are referred to our office from other eye care providers due to our expertise in fitting these patients. If you have previously failed in rigid contact lenses ask our eye care professionals about Synergeyes ClearKone Hybrid contact lenses or FlexLens Tricurve Soft contact lenses. Challenges such as astigmatism, presbyopia, keratoconus and dry eyes needn’t be a barrier to contact lens wear, but they do require more time and patience. CustomEyes provides more information about hard to fit cases.